I’m here to set you up with a breakfast or snack bar that is delicious and mostly healthy. 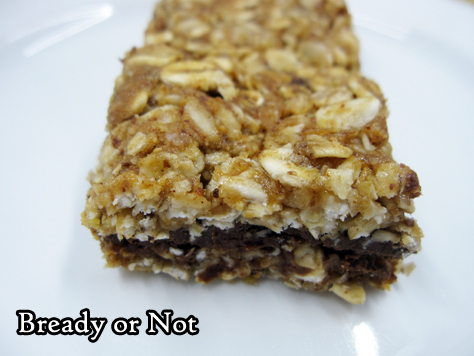 Plus, these No Bake Chocolate Almond Bars can be tweaked for several dietary needs! If you need gluten-free, use GF rolled oats. If you need dairy-free, use different chocolate chips. If you have nut allergies… well, you could probably use all-purpose flour and a different nut butter or even Biscoff spread, but I haven’t tested that mod myself. Though I did test this recipe. A lot. Because it kept coming out tasty, but still a bit off. 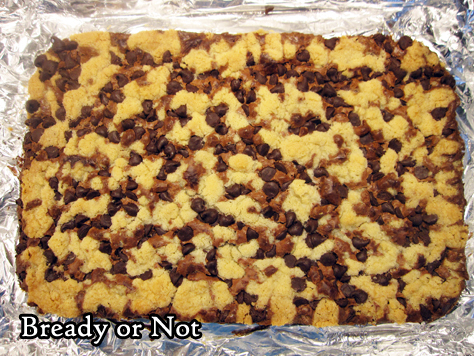 The first try, I used milk chocolate chips, which is always my preference in cookies. To my surprise, I found the end result to be too sweet. The second try, I became quite frustrated when pressing the base layer into the pan. It was a big sticky mess. Therefore, by the third try, I knew what to do. Use semisweet chips. 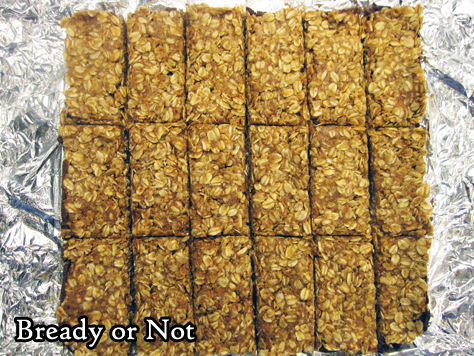 Chill the oat mixture from the time it is mixed. I also found that these bars were fantastic to freeze; just use waxed paper between the stacked bars. Tweak this recipe to be gluten-free by using GF rolled oats–and it can even be dairy-free by using select chocolate chips! Plan to assemble this recipe over a few hours as you must chill the ingredients between each step. Also, best to avoid milk chocolate this time around, or the bars will be excessively sweet. Use semisweet or dark chocolate instead. In a large bowl, mix together all of the crust ingredients. The mixture should be sticky and clump together. 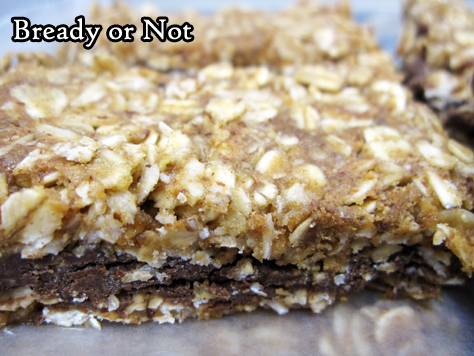 If it's not cohesive, add more almond butter; if it's too wet, add some more oats and/or almond flour. Chill bowl in fridge for an least an hour. Line an 8x8 or 9x9-inch pan with aluminum foil and apply nonstick spray. Press half of the crust mix evenly into the bottom of the pan. A piece of waxed paper or parchment and a heavy glass make it easier to compress as much as possible. Place pan and bowl in fridge for another 30 minutes. 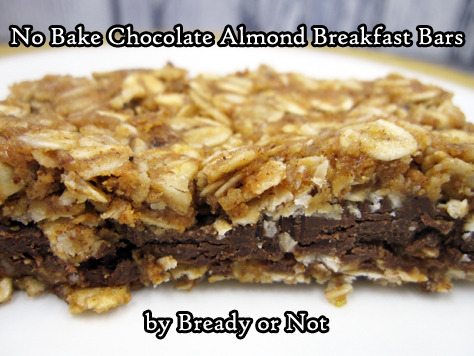 In the microwave or in a pan on the stovetop, melt together the chocolate chips and remaining almond butter. When they become creamy and smooth, remove from heat. Pour the chocolate to completely cover the oat layer. Chill for another hour. Dollop the remaining oat mixture atop the hardened chocolate. Again, compress contents into pan as much as possible. Chill another 30 minutes. Use the foil to lift contents onto a cutting board. Slice. Keep bars for up to 3 weeks in the fridge, in a sealed container with waxed paper between the layers, or freeze for up to a month. I review everything I read and post reviews on Goodreads and LibraryThing. That’s not enough. Good books are meant to be shared. Therefore, I’m spotlighting some of my favorite reads here on my site. Mahimata is the second book in a duology and will be released on March 5th. I had both books supplied to me gratis by the publisher (also my publisher) and loved both. If you haven’t read the first book, seriously, get it NOW and preorder the second book. “Markswoman is a breathlessly-paced post-apocalyptic fantasy with a highly original setting and characters you can’t help but love (and hate).” To add to that: Post-apocalyptic magical knife-wielding female assassins FTW. 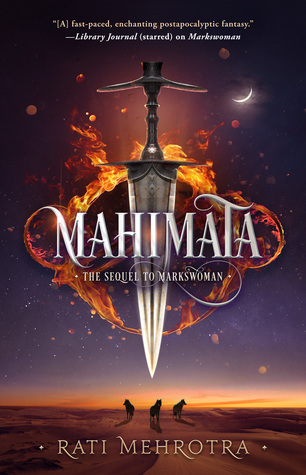 Rati Mehrotra’s Asiana duology comes to a fantastic conclusion in Mahimata. In this Asian-inspired fantasy settings with unique sci-fi twists, Kyra is a highly-trained assassin telekinetically bound with her blade. Her world has erupted in war. Her sect has fought against local wyr-wolves for centuries, but now a greater–human–threat has emerged and threatens to take over Asiana. In the turbulence of the first book, Kyra met and fell for Rustan, of a rival sect–and also almost died. As Mahimata begins, she struggles to recover physically and reconcile herself with what she has learned about her sect, her power, and her world. The action is intense and well-grounded in genuine emotions. I especially love how the wyr-wolves developed. This is a book all about maturity and growth for both Kyra and Rustan as they fight to save their people at great cost. I’m sorry to see the series end, but this conclusion truly hits all the right notes. 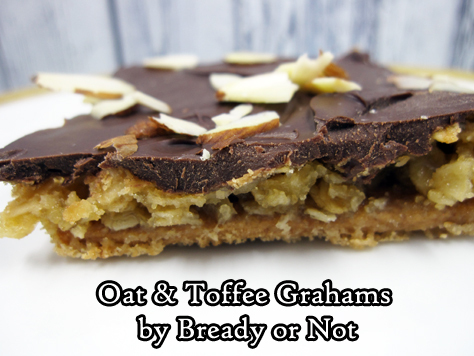 These Oat and Toffee Grahams are a delicious, unique kind of fast-fix homemade candy bar. 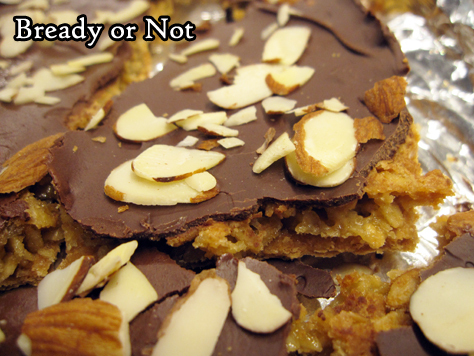 On top of that you mix up a homemade filling with oats, butter, sugar, and a few other things, and it bakes up into a kind of toffee layer. Then you add the chocolate chips on top–bake it a minute, long enough to melt the chips–even out the layer and add some almonds. Ta-da! I expected the end result to be crunchy. To my surprise, the crackers actually softened in the baking process. The end result was delightfully chewy. 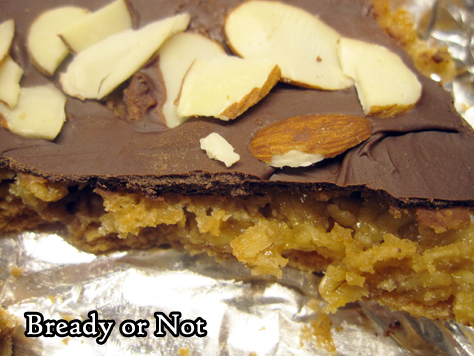 These are sweet, sublime, and chewy, with crunchiness only from the almonds. They are just a great combination of flavors and textures. 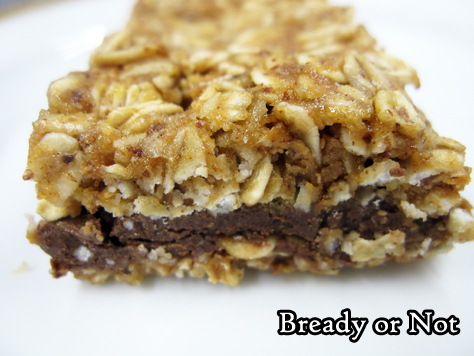 Modified from Brownies & Bars Magazine. 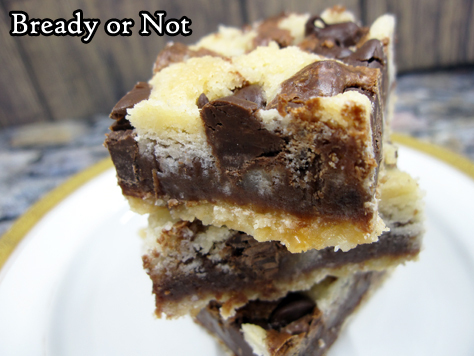 This recipe uses graham crackers as a shortcut base for a sheet pan of homemade candy bars! 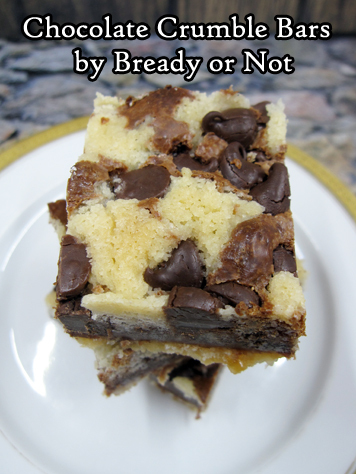 The end result is chocolaty, sweet, and surprisingly chewy. Preheat oven at 350-degrees. Line a 15x10x1-inch baking pan with foil and apply nonstick spray. Arrange graham crackers in a single layer side by side. They will not cover the entire surface of the pan. In a large bowl, stir together the oats, white sugar, brown sugar, and flour. Stir in the melted butter, egg, and vanilla until just mixed. Spoon the oat mixture atop the graham crackers, covering them completely. Bake for 20 to 25 minutes, until top is bubbly. Sprinkle all of the chocolate on top. Bake for another minute. 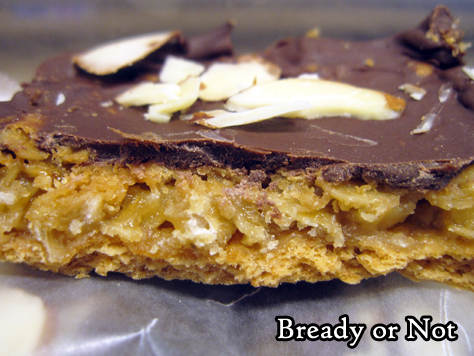 Use an uneven spatula to smooth the softened chocolate to cover the graham crackers. Sprinkle on the almonds. Cool in pan. If slow to set, place in fridge until firm. Use a knife or--recommended--both hands to break the bars into pieces. Store in a sealed container with parchment or waxed paper between the layers. This book is massive. 1100 pages, hardbound. This is the kind of book you want to use to wallop burglars. 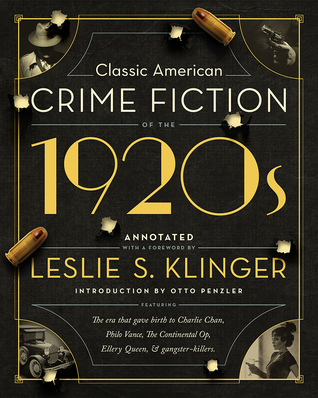 That’d be an especially appropriate use of this anthology, too, since it covers a full range of 1920s crime novels. Overall, it’s a fascinating read. You get the first books of several major detective series, like Charlie Chan and Ellery Queen. Even the book with an almost unbearable protagonist, Philo Vance, gave me oodles of useful research notes and an interesting mystery as the backbone of the piece. Dashiell Hammet’s first book is a veritable blood bath, but a masterfully done one at that. Reading Little Caesar, I can well understand how this established the gangster novel–and movie–genres. There is a lengthy introduction at the start, giving context for each book. The annotations throughout were very useful (indeed, for the gangster novel Little Caesar, the lingo would’ve been a challenge to parse otherwise) but I also found myself wanting more annotations. If you love classic mysteries and want a showcase book, this is worth the hefty price. (I bought my signed edition from Poisoned Pen Bookstore in Scottsdale, Arizona.) But do be aware it is a difficult read because of the sheer size of the book. Not only is this book impossible to tuck away in a purse to read on the go, it’s awkward to read wherever you may be. Still, I found the challenge to be more than worthwhile in the end. My reviews for each included book are found below, and are also posted under the individual book listings on Goodreads and LibraryThing. Charlie Chan is an iconic character, and it was interesting to see him within the context of his first novel, published with its original text. The book surprised me in many ways. First of all, the settings within the book are masterfully portrayed. I’ve never seen a book so vividly describe Hawaii in the 1920s. The annotations remarked a few times on inaccuracies or fictionalized bits, but many of the details felt spot-on (I say that, having extensively read on early 20th century Hawaii for my own novel). While I expected issues with racism and caricatures because of the era, this was not as bad as I expected it would be (how’s that for an endorsement?). Charlie Chan is regarded as something of a mockery now, but as the notes observed, he does not speak pidgin Chinese, but talks as a very highly educated man. The text of the book demonstrated that well. The way white characters reacted to Chan felt realistic (though sad), but I also understood well why the original text had Chan racist against the Japanese. Within the context of the time, that made perfect sense; it’s worth noting that these racist snippets were toned down or removed in later editions of the book. This does not develop as a modern murder mystery does–often with a corpse in chapter one. Instead, the start is slow as the reader gets to know the Winterslip family of both Boston and Honolulu. The dead body doesn’t show up until almost a hundred pages in, with Charlie Chan’s arrival immediately after. I think my biggest surprise about the book was that Chan was a minor character with a pivotal role. Instead, most of the novel followed the stuffy scion of the Winterslip family. His was not a bad perspective–it was enjoyable to watch him grow across the book–but I expected a Charlie Chan book to, well, be more about Charlie Chan. The murderer was fairly obvious to be from early on, though there were some nice twists and turns leading up to the big reveal at the end. I feel no urge to read onward in the series, but if I need to do more research on 1920s Hawaii, I just might. The book was not a bad read at all. Intriguing, I’d say. I must say, the first chapter of this book convinced me that it was going to be absolutely dreadful. It probably didn’t help that preceding information in the book had pointed out that the Philo Vance series eventually withered and died because the insufferable, rambling nature of the lead character became too aggravating to bear. But once I made it past that initial introductory chapter and to the actual murder, the story was much more engaging. The positives: It’s a good murder mystery. The set-up is complex and intriguing, and it nicely utilizes New York City. Alvin Benson is found dead, shot in the head, and the clues in his house are myriad, from the handbag and gloves left on the mantle to the car parked out front during the night. The district attorney invites his friend Philo Vance to see the crime, and on a whim, the insufferable art collector digs into the mystery, and digs in deep. The way Philo Vance psychologically examines people is fascinating. I liked that I guessed the murderer quite early on. The negatives: Philo Vance. He’s aggravating. He boasts throughout that he’s known who the murderer is from the time he first viewed the corpse at the crime scene, but he strings along his DA friend for days, relentlessly teasing him and shredding apart his reliance on circumstantial evidence. While the latter is necessary (the DA was ready to convict several people on tenuous evidence), the whole know-it-all aspect gets old really fast. The choice of narrator felt utterly useless, too. Another of Vance’s friends is the observer of everything, and he contributes nothing to the story. He’s no Watson, there to offer occasional advice or act as a foil or do medical examinations. No, this guy is just there, a shadow. I can’t even remember his name; it only came up at the very beginning, I think. I wouldn’t read onward in this series, I think, because the very idea of Philo Vance becoming even more annoying is a big turn off. That said, this book offered me a tremendous boon in terms of research, with fantastic period details and cultural references. Thus far in this collection, I’ve read the first books about Charlie Chan and Philo Vance. Both had issues, from my modern perspective–a painfully slow start and barely any Charlie Chan in the first, and the rambling, annoying presence of Philo Vance in the second. But in this, the first Ellery Queen novel, I finally encountered a 1920s mystery I absolutely loved. The writing is fantastic from page one, the mystery utterly intriguing, and the cast of characters diverse and amusing. I could see myself reading and enjoying more Ellery Queen novels. Red Harvest is aptly named, a bloodbath of a 1920s noir novel. When the unnamed private detective rolls into Personville to meet a new client, the client is found murdered. The Op goes about solving that murder, and becomes embroiled in pretty intense gang warfare that gets far nastier after the original murder is solved. This is a fast read, with knife-sharp language and wit. The Op is a character with virtually no background or personality, but he has a brutal edge and a will to survive. It’s no wonder this character helped to establish the very trope of the hard-boiled PI, complete with steady applications of scotch. Little Caesar is the first major gangster novel, published in 1929. It was made into a famous 1931 movie–and essentially created the gangster stereotype (one I became most familiar with through Bugs Bunny cartoons). The book itself is an interesting study on the ‘voice’ of a book, as the author goes deep into gangster lingo. At the end of my edition, the editor included a foreword that the author wrote in the 1950s about the writing and rejection process behind the book. He made a conscious choice to strip away adjectives to make the prose bloody and blunt. It works. The book doesn’t try to make you like its characters–it just shows them as they are. I was grateful to have the annotations to help me parse the lingo and explain details about Chicago and guns of the period. I never would have expected to like the book this much, but it fascinated me. It shows the era with all its ugliness and racism and dames and plates of spaghetti with wine. Now I want to watch the movie to compare. 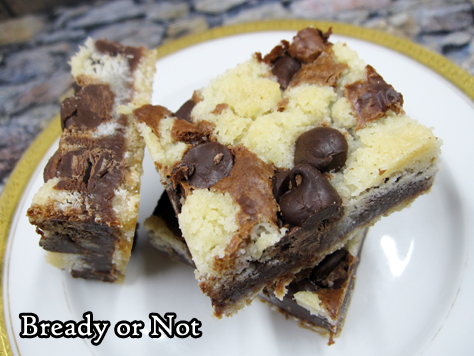 I always like to do a chocolate recipe near Valentine’s Day, and this year I present to you a recipe for easy, delicious Chocolate Crumble Bars. 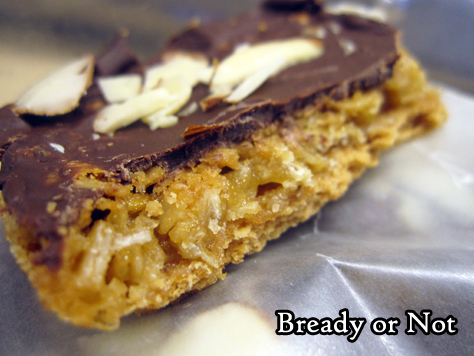 I tend to regard crumble bar recipes with suspicion, because many times they do indeed crumble when cut. I was very happy these bars were cohesive. They are also incredibly good. 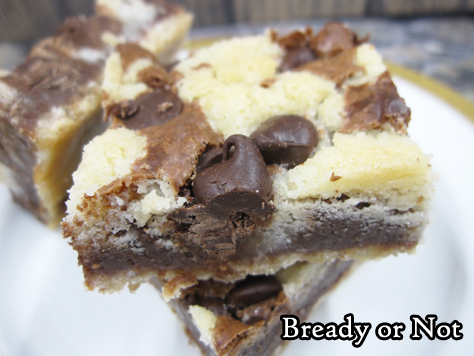 The shortbread-like base is the perfect complement to semisweet chocolate chips. Plus, there’s just something satisfying about a good, basic crumble topping. But then, I always preferred crumble topping on apple pies rather than a closed crust as well. I suppose I’m just a crumbly person. 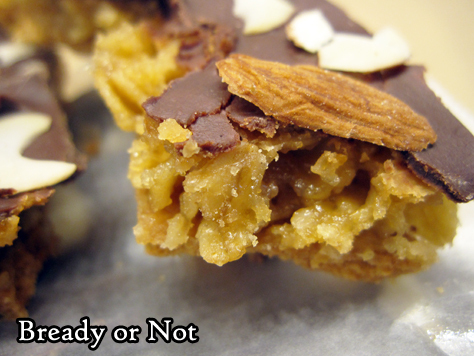 If you’re also a crumbly person, give these a try! They are easy to make and oh so good. 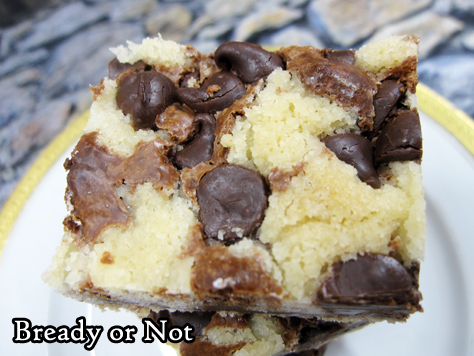 These bars look gorgeous with their marbled-dough tops, but they’re also chewy, chocolaty, and delicious. Plus, they’re easy to make, with basic ingredients! Preheat oven at 350-degrees. Line a 13x9 pan with aluminum foil and apply nonstick spray. In a big mixing bowl, beat butter until creamy, followed by the flour, sugar, and salt. Mix until it turns crumbly, scraping the bowl as needed. Place 2 cups of the crumbs in the pan. Use floured fingers or a piece of waxed paper and a heavy glass to compress the crumbs evenly. Bake pan 11 to 15 minutes, until edges of base layer are turning golden brown. Place 1 cup of the chocolate chips and the sweetened condensed milk in a large microwave safe bowl [or, alternately, do this on the stovetop]. Zap about 30 seconds, stir well, then try another 15 seconds--watch very carefully! It can turn molten, fast. Once it can be stirred smooth, add vanilla extract. Spread over the hot crust. Stir remaining cup of chocolate chips into the reserved crumb mixture. Sprinkle this over the top of the chocolate layer. Bake for another 25 to 30 minutes, until center is set. Cool completely in pan. Use the foil to lift contents onto cutting board. Slice. Store bars in a covered container, waxed paper or parchment between the layers, at room temperature.